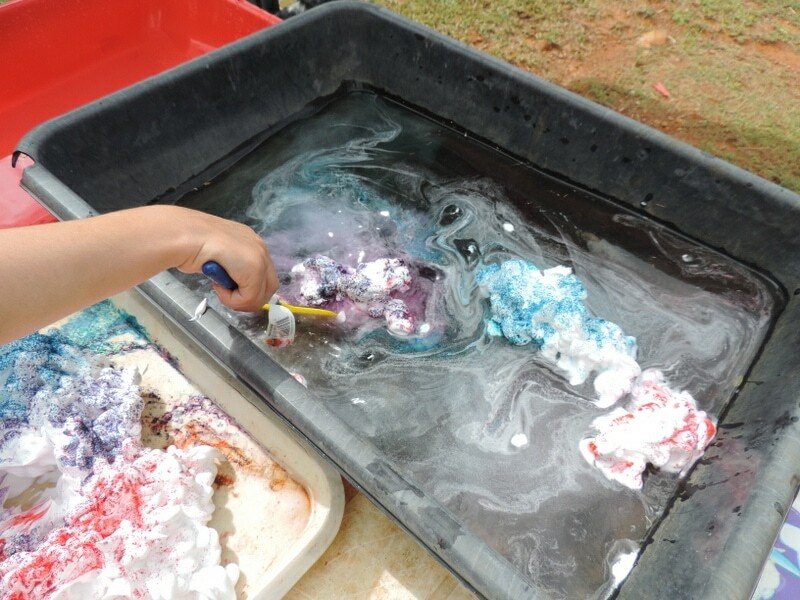 This simple sensory play activity is fun whether it’s hot or cold and easily adaptable for both toddlers and older children. 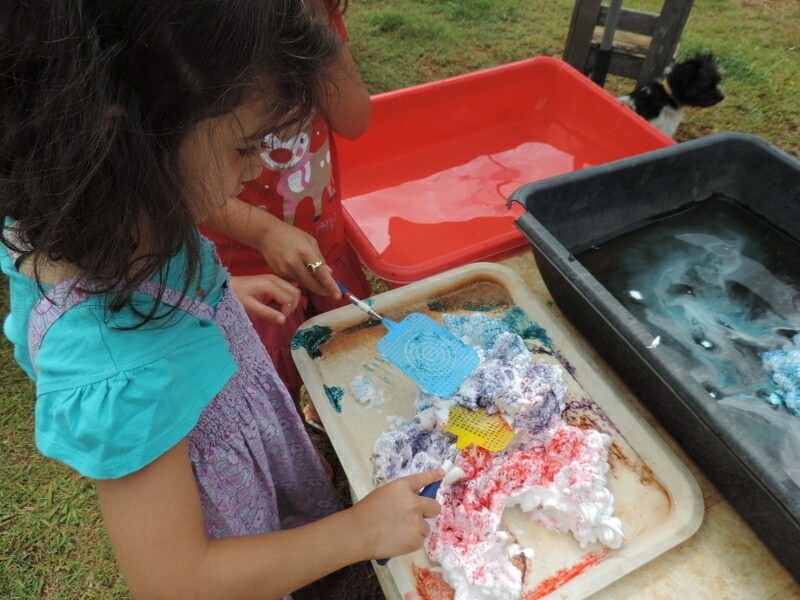 It not only offers many opportunities for children to explore with their senses but it’s a playful way to strengthen fine motor control, balance, coordination, spatial awareness, colour mixing and colour recognition. As an added bonus for busy educators and parents this activity is simple to setup and when finished everything (and everyone!) just needs a quick blast with the hose to clean up. Definitely one for the outdoors though unless you want to be finding drops of coloured foam throughout your room for the next week! What do I need for setup? Large deep trays or tubs half filled with water. You could also use smaller tubs for individual children if you wanted. A low table or surface the children can easily reach across and move around. A bucket of water and cloths close by for those children that need to regularly wash their hands to remove mess before continuing. 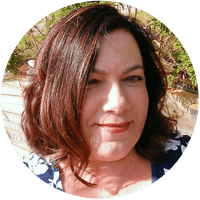 I like to do these couple of steps before the children begin the activity especially if working with a multi age group – it’s just easier! Line up tubs of water on your table or other flat surface (if it’s colder weather use a tub of nice warm water instead of cold). 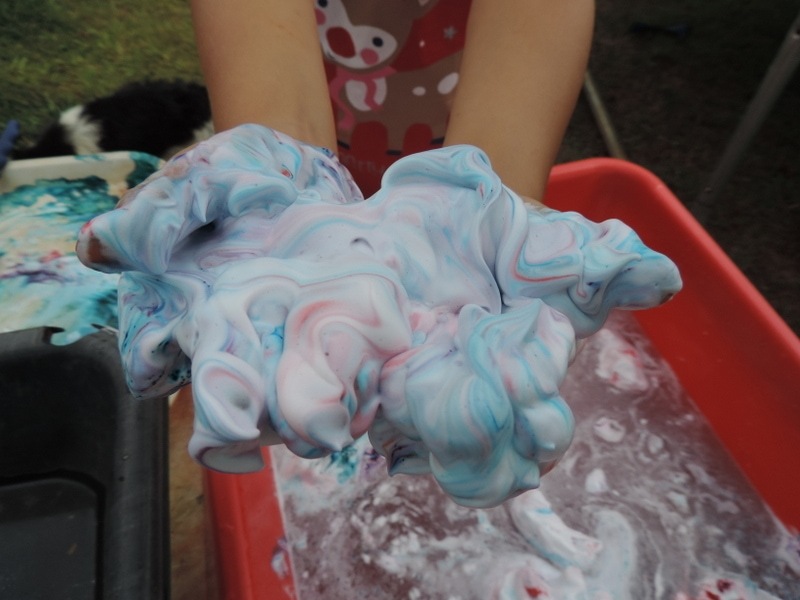 Shake the shaving foam can and spray onto trays or table while also adding a few ‘icebergs’ to the water tubs. 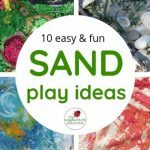 Depending on the age and current skill level of the children doing this activity you might encourage play in the following ways…. 1. 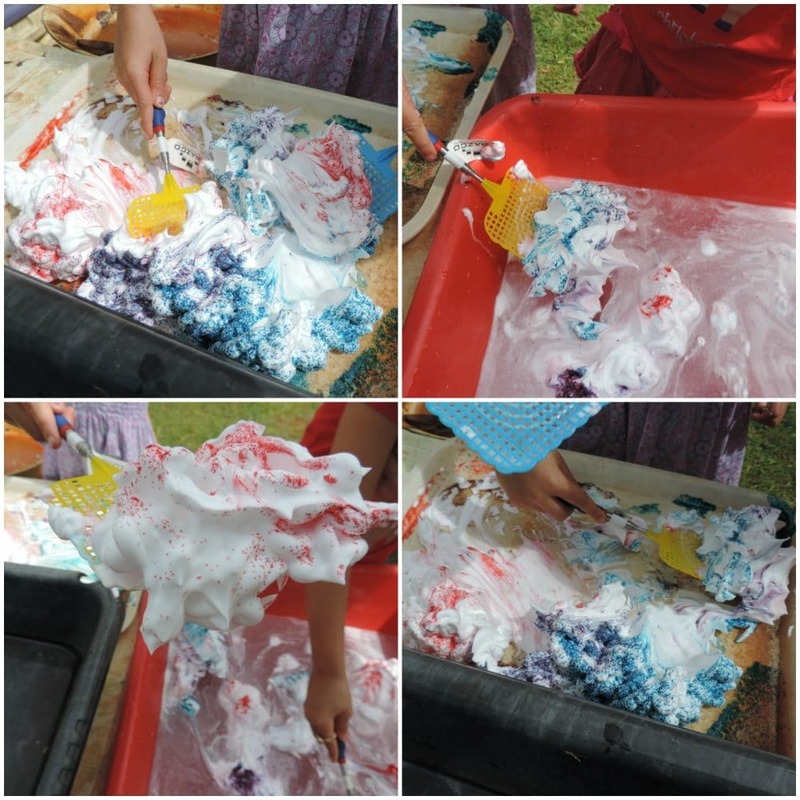 Children use the flyswatters to scoop icebergs from the trays or table and add to the water tub – can you do it without them breaking up? Do they float or sink? 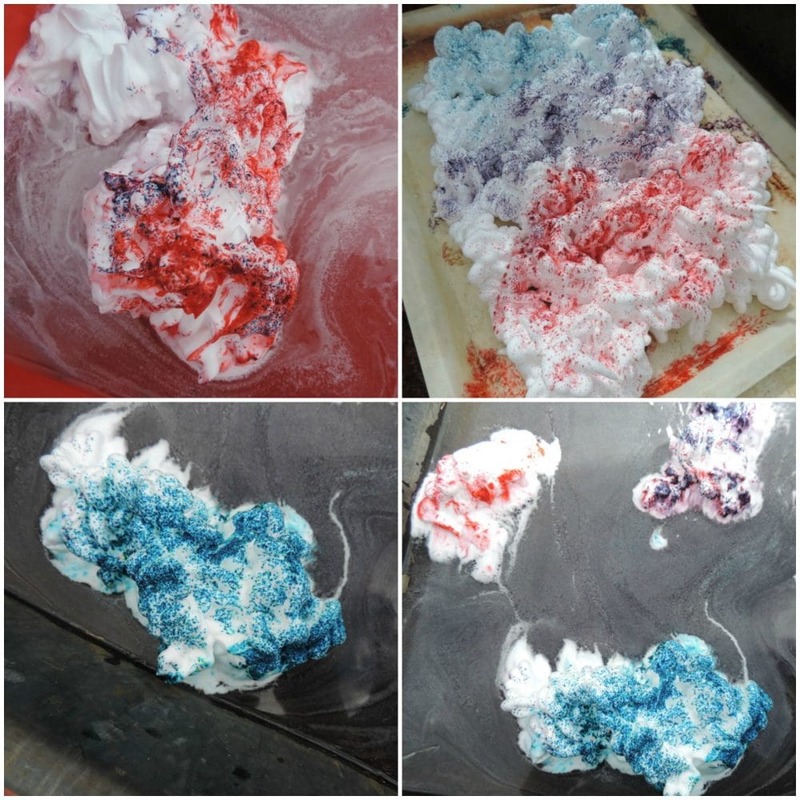 What happens to the foam when the colour powder mixes with water? 2. 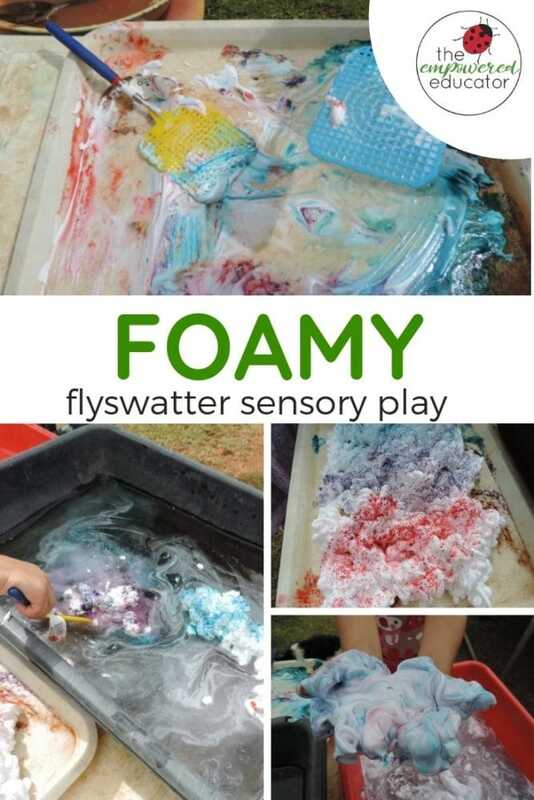 Go fishing and use the flyswatters to lift the foam out of the water and back onto tray or swap to another water tub. It’s tricky but the fun is in the trying and process. It doesn’t matter if they all break up within minutes, they will still enjoy ‘fishing’ in the water to find and scoop up bits of the foam before it all disappears! 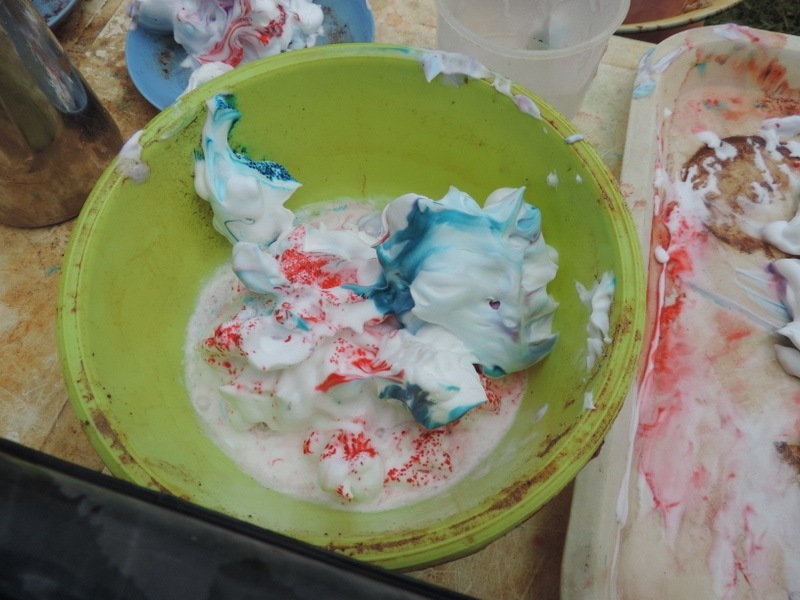 Scooping, teamwork, communication, experimenting and arranging …. 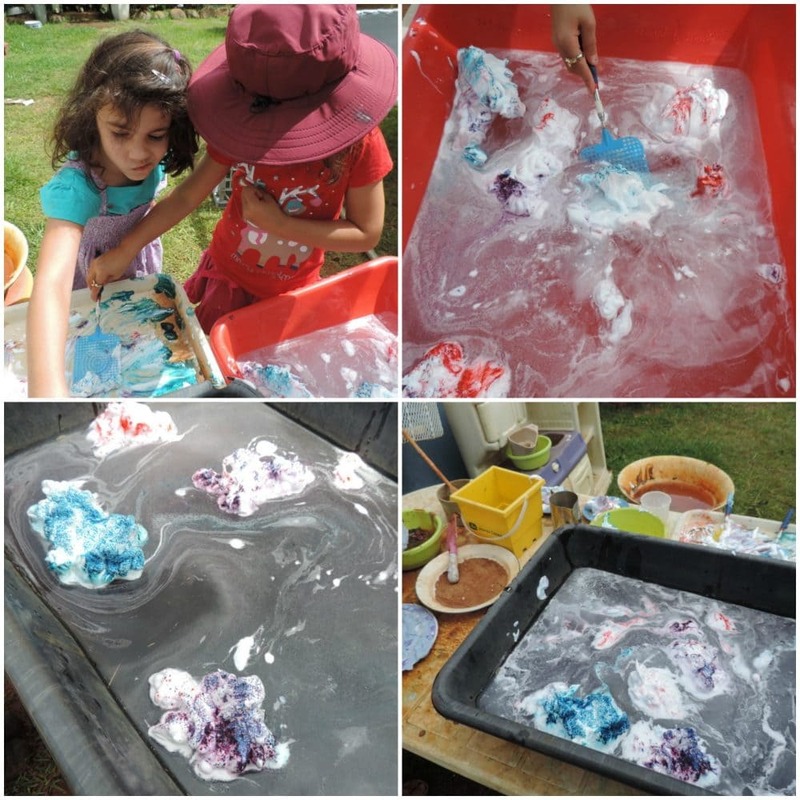 Making patterns, problem solving, using hand muscles and coordination skills as they concentrate on adding to the water then lifting back out without breaking up the iceberg! 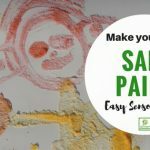 Obviously older children will spend more time engaging with this step – don’t expect it of toddlers though. 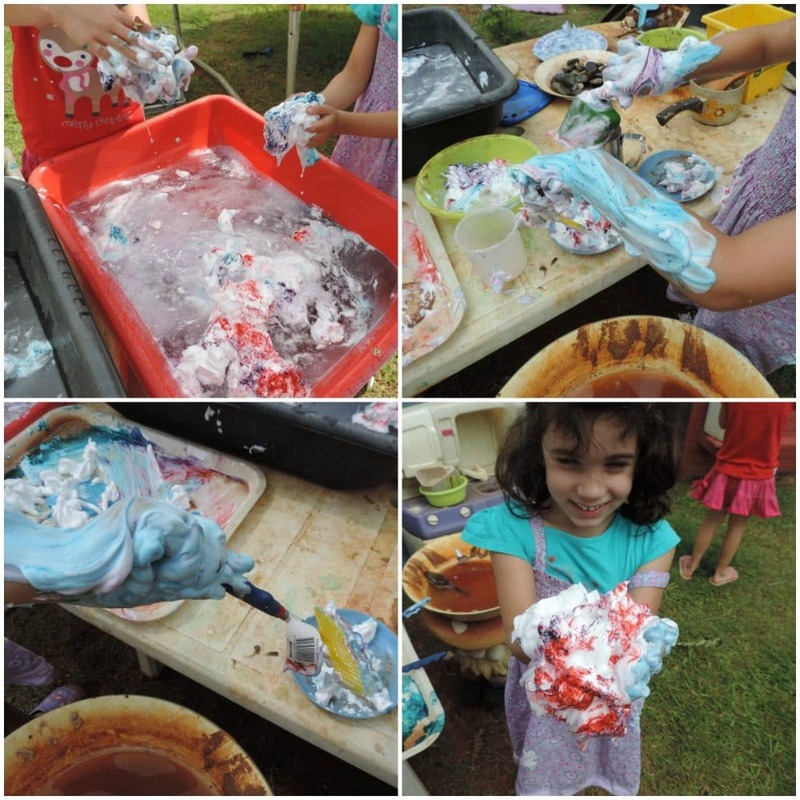 Just allow them to scoop, mix, pat, swat and generally explore while making a mess! 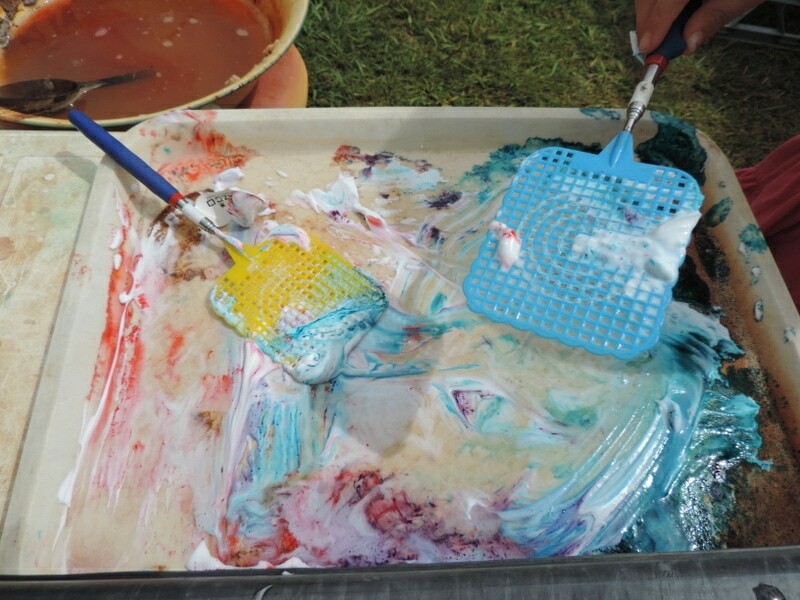 We had fun mixing colours and pushing them together in the water to create new colours. 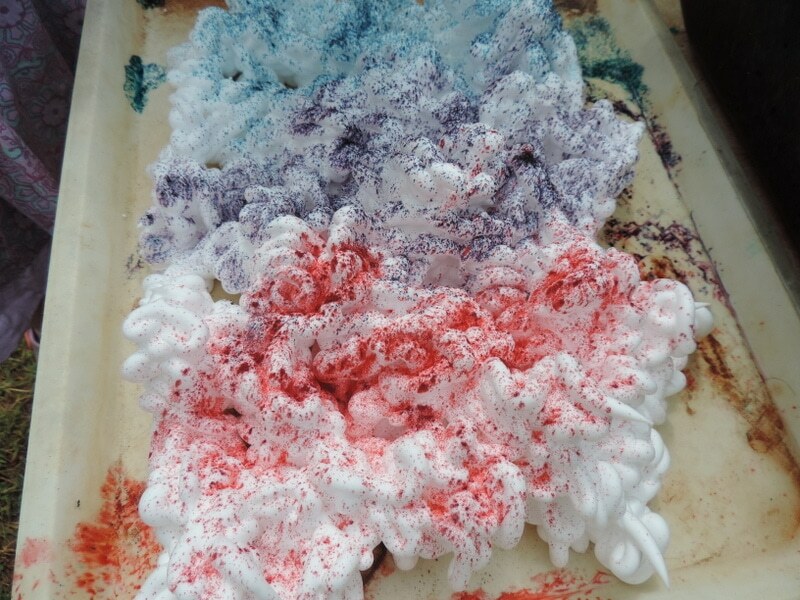 I left the dye just sprinkled over the top of the foam as I wanted to see how the children interacted with it but you can mix it in at the start if you prefer separate bold colours. 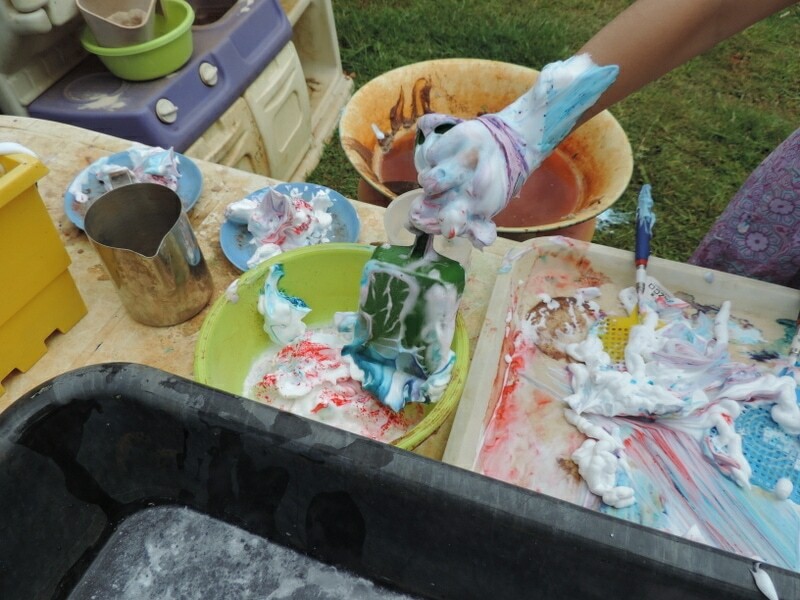 When they grow bored of fishing and the foam has really started to break up why not extend the sensory play by setting up a little outdoor kitchen. Keep it simple though! 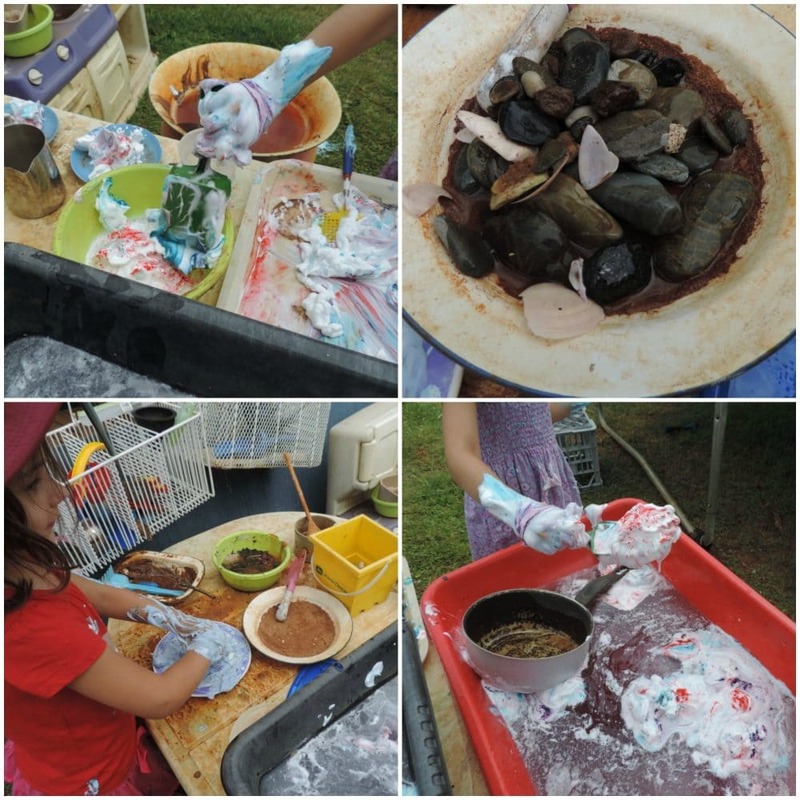 The children chose some bowls, spoons and a few other loose parts we have always hanging in our baskets outside for cooking and messy play. 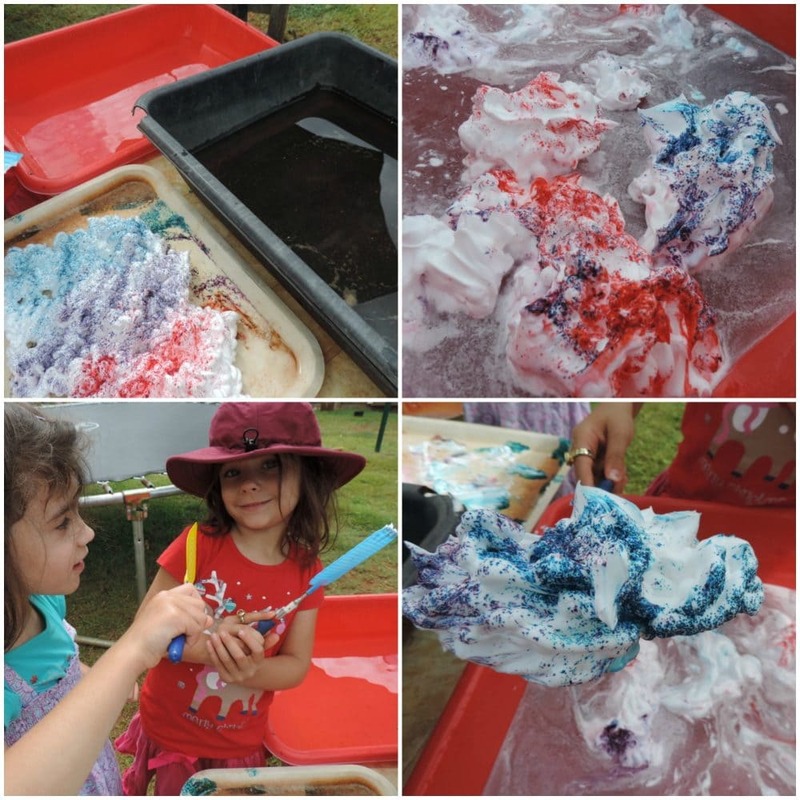 The addition of foam and water adds a lot of scope for both role play, fine motor fun and of course the joy of getting messy and creative! As always we also ended up with lots of red mud to incorporate too somehow. 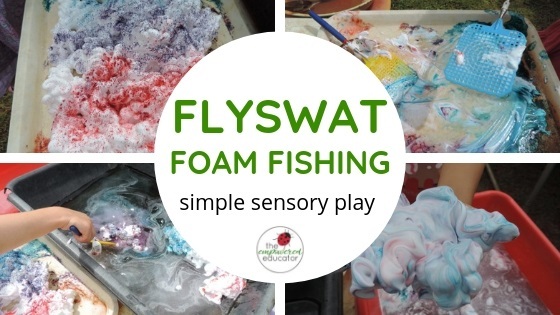 You can also encourage children to ditch the flyswatters and just get those hands in there to really mix the colours and explore with the senses. There were some very interesting culinary creations on this day and it kept everyone busy for a long time! 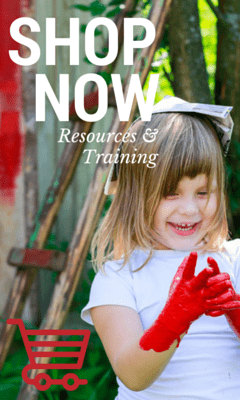 Toddlers will come and go to this sort of activity as they work with shorter attention spans but that is the beauty of having this sort of activity set up outdoors – no need to pack up quickly. 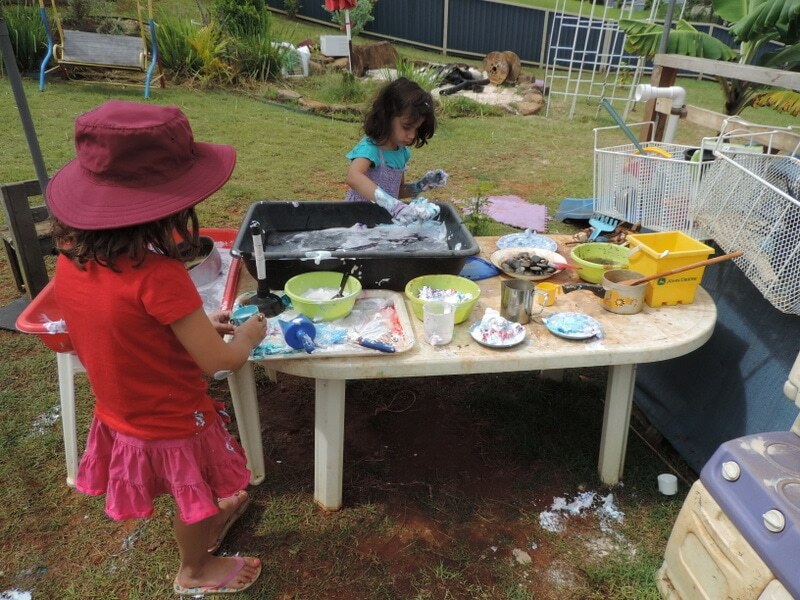 When you are ready to pack up I suggest just piling all utensils etc into a water tub with a few sponges so the children can help to wash and lay out in sun to dry while you quickly hose off tables. The foam actually dries quite silky on skin so no need to wet little legs again – just wipe off with a towel before you head inside. On Pinterest? Follow me HERE and pin the image below so you can find this activity again easily! Looking for more inspiration like this for early learning? 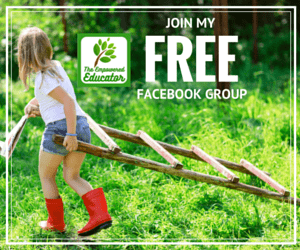 Join early childhood educators and homeschool parents from across the world in the Empowered Educator Community. 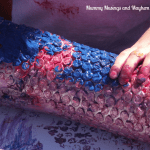 DIY Sensory Bubblewrap Roller Painting – With Tips to modify for SPD children. 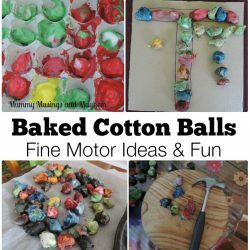 Fun Fine Motor Ideas with Baked Cotton Balls..
« 10 Tips to Manage Daycare Paperwork!